Few publications have been devoted to twentieth century architecture in Wales, and consequently little is known of many of its award-winning projects. This article explores a few of these buildings, and the wider architectural movements with which they can be associated. Sully Hospital was the finest Modernist sanatorium to be built in Britain. Opened in 1936, it was later described by the architectural historian John Newman as ‘an outstanding example of inter-war Functionalist architecture.’ Funded in part by donations from wealthy mine owners, it was purpose-designed for the architecture to assist in the treatment of the tuberculosis sufferers it was to serve. The coastal site afforded panoramic views across the Bristol Channel and the façades reflected the era’s fascination with the therapeutic benefits of naturally lit and airy internal environments, enabling the maximum light and air to be admitted through the wide expanses of south-facing glazing. On plan, the southern wards are arranged as a pair of v-shaped protrusions that create protected cliff-top gardens in which patients could take the air whilst sheltered from the sea breeze. The adoption of steel-frame construction, a pioneering move during the early 1930s, enabled the architects to incorporate wide expanses of openable glazing in the white rendered, non load-bearing walls. Upon completion, the hospital quickly became an icon of the Modern Movement in Britain and is now one of the last great Modernist buildings left in Wales. Its form recalls Alvar Aalto’s sanatorium at Paimio in Finland, completed only three years prior to Sully, of which Pite and Fairweather must have been aware. At Paimio, a concrete frame similarly permitted the use of long rectangular windows, whilst an attenuated plan ensured that all patients received the greatest possible exposure to light, clean air and forest views. The ideology of Modernism not only presented architects with new ways of designing for living and healing, but also with new ways of accommodating increasingly efficient industrial processes. This was most successfully demonstrated in Wales with the construction of the Rubber Factory at Brynmawr. 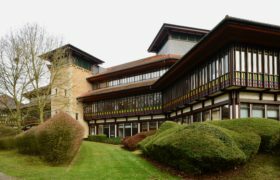 Designed between 1946 and 1951 by the Architects’ Co-Partnership and the engineer Ove Arup, the building was the vision of Lord James Forrester who propagated an idealistic concept, seeking to make a building of both social and architectural significance. The programme involved the regeneration of Brynmawr socially, economically and physically. Measures were taken to ensure the provision of a pleasant yet functional working environment for the local workforce who had suffered terribly following the collapse of the South Wales coal industry in the 1920s and 30s. Described as a ‘masterpiece of the modern age’ the design’s extraordinary structural solution incorporated innovative shell concrete construction first developed in Germany. The completed project featured in European and American journals and was visited by two of the greatest architects of the twentieth century: Le Corbusier was taken to see the project during a short stay in Britain and Frank Lloyd Wright made a special visit when he arrived in Wales on a tour of his ancestral homeland. Difficulties in securing a sufficient number of production contracts plagued the factory from an early stage and, by January 1982, it was forced to cease production permanently. In May 1986, despite its closure, the scheme became the first post-war building to be listed. Unfortunately the Grade II* listing did not save it and, after a lengthy conservation battle, the factory was demolished in 2001. The design of the Rubber Factory was highly imaginative and its social gestures well-judged but, in the end, the building proved too large and too ill-planned, economically speaking, to adapt to the changing needs of its locality. As in the rest of Britain, late modernism of the 1960s and 70s was particularly influential in the design of working environments in Wales. The architect Dale Owen trained at the Welsh School of Architecture and in London, before winning a scholarship to Harvard University and eventually joining the office of Walter Gropius. In the late 1950s, Owen returned to his native Wales and began working for Percy Thomas & Son in Cardiff. He designed the Cardiff headquarters of BBC Wales in 1967. The design combines a long, low-rise building housing the studios with a tower containing the office accommodation. Elements of the scheme bear a resemblance to Gropius’s design for the Graduate Centre at Harvard which Owen must have encountered during his time at the University. Each of the building’s functions is expressed volumetrically: the canteen appears to float above the car park, the tower contains the administration facilities, the smaller studios are spread along the roadside, and finally, the more spacious volume of Studio 1 adds a full-stop to the original street elevation. This principal elevation is formed from a combination of glazed and solid elements that express the functions of the spaces concealed within the building [see cover]. These variations are made possible by the same means as those employed by Pite & Fairweather thirty years earlier at Sully. In this instance, a re-inforced concrete frame structure enabled Owen to realise an architecture of opposites for the headquarter’s studio wing: the massive volume of Studio 1 is approached along a generously glazed circulation route intermittently punctured by the smaller elements of the more solid, marble-clad radio studios. The entrance canopy to the tower building shows the influence of Mies van der Rohe’s designs for Lake Shore Drive which Owen must have known of, if not visited, during his time in America. An equally Miesian attention to structural honesty and expression can be found in the projections of the concrete-clad steel roof trusses of Studio 1 that are clearly legible on the primary elevation and in the articulation of the columns within the tower building. The building continues to serve the BBC today, providing a functional yet comfortable working environment almost forty years after its opening. The chunky, textured forms of Welsh castles can arguably be seen to have been the inspiration when Maxwell Fry accepted the commission to design a crematorium at Coychurch, Mid Glamorgan. 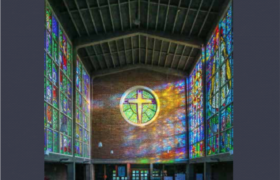 He and Jane Drew had worked with Le Corbusier in the 1950s and the influence of his design for the church at Ronchamp is evident in their work here. The heavy, rough-shuttered concrete roof, stone walls and filtered light arouse a similar sense of solemnity to Ronchamp, and reveal the architects’ delight in materials displayed in their natural state. Completed in 1970, the building consists of a pair of linked memorial chapels constructed from local stone reclaimed from nearby demolition projects. Sited by a lake it sits comfortably within the landscape. Capel Crallo, the larger chapel, is approached via an enclosed cloistered walk, an idea Fry attributed to a rethinking of the process of mourning following his participation in the Hindu funeral of a member of the Chandigarh team during his time in India. A canopy roof, Corbusian in its monumentality, reaches out to the waters of the lake and marks the entrance to the walk. Each chapel is distinct in character, the larger one lofty, spectacularly roof-lit and with massive, rough-plastered concrete walls and a wooden ceiling and floor. Sunlight is funnelled into the space above the catafalque and floods the area below with light, recording the passage of time as a service progresses. The original rooflight was an impressive presence on the front elevation but has since been demolished when essential work was carried out on the adjacent furnace chimney. The smaller chapel, Capel Coity, has cedar and stone-clad walls coupled with a brick floor. The materials lend the interior a more intimate feel, and a continuous band of clerestorey glazing allows sunlight to track slowly across the space during a service. The exterior of this chapel is cedar-clad, and the whole space is roofed in copper. The quiet repose inside is strongly reminiscent of the very best interiors of the Scandinavian Modernists, while attention to the Welsh vernacular in the form of the cloister, the main chapel and tiny Chapel of Remembrance, although slightly romantic, lends the building a timeless quality. Scandinavian Modernism reached its height in the mid 1950s and some of its best-known interiors, such as the domestic projects of Alvar Aalto, Arne Jacobsen and Jørn Utzon, were a major influence on Graham Brooks who completed the Capel House for his Cardiff-based clients in 1966. The spatial arrangement of the interior employs a language first seen in Frank Lloyd Wright’s revolutionary Prairie House projects. The accommodation is organised in a pinwheel, with living and sleeping spaces arrayed around a generously proportioned central entrance hall. The wings of the house extend into the grounds and the timber frame allows for the complete dematerialisation of the perimeter of the living areas. Glazed façades reinforce the feeling of spatial continuity within the design as the interior space spills out from the constructed extremity and on into the garden, uniting the built space of the project with its site. The white-painted brickwork, black-stained timber beams and hardwood ceilings lend the architecture its unmistakably Scandinavian spirit. It is important to note, however, that Brooks was not simply imitating a preferred style: his design for the Capel House enabled him to explore the constructional logic of a timber frame system that he chose to leave completely exposed. In this way he achieved generous overhanging eaves and minimised the impact of the building’s foundations upon the root systems of mature trees on an adjacent property. Scandinavian Modernism took the basic concepts of Modernism and humanised them through the use of native materials in order to create buildings that held a deeper sense of regional identity. By drawing on organic forms and the vernacular, the emergent architecture was at once wholeheartedly habitable and undeniably ‘Modern’. Its ideals appear to be a rich seam when considering the question of building in Wales today. By combining a respect for landscape and the vernacular with a preference for locally sourced materials, many architects working in Wales today are continuing to create buildings of lasting worth, accommodating the wisdom of the past whilst embracing the technologies of the future.